Basement of Ghoulish Decadence: FlashFulci? LucioDance? 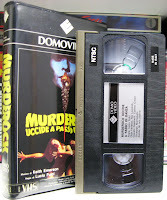 The Italian Domo Video VHS of Lucio Fulci's Murderock - uccide a passo di danza arrived today. The interesting thing is that the tape is in the primarily U.S./Japan NTSC video standard instead of the European PAL standard. Otherwise, this edition is 100% identical to the "real" Italiano tape, right down to the untranslated back synopsis and no subtitles for the Italian audio. I've never seen the flick (no real desire), but the price was right and I figured this is much rarer than the Shriek Show DVD being a horder of obscure Fulci videos. The movie was pretty good. Olga Karlatos from Zombie was very nice to look at and it had Ray Lovelock too. Domovideo released a number of NTSC Italian language only releases in America in the eighties including Ernesto Gastaldi's LIBIDO and the 125 minute version of Argento's DEEP RED.